"The Guardian’s picture editors select photo highlights from around the world"
"Anti-Brexit protest signs are displayed in London"
"Against the backdrop of a Conservative Party leadership race and talk of a looming general election, MPs will on Monday hold a second round of so-called indicative votes on alternatives to Prime Minister Theresa May’s Brexit deal. The option expected to get a House of Commons majority is for a customs union — a much softer Brexit than the one offered by the prime minister. The vote isn’t binding, but the PM will come under intense political pressure to adopt whatever parliament decides." "Protesters calling for Brexit rallied across London as MPs voted on Theresa May's Withdrawal Agreement." "Hastings Pier, the Put it to the People march, rappers and poets – the best photography commissioned by the Observer in March 2019"
"Election also on the cards after MPs reject withdrawal agreement by 58 votes"
+ How did each MP vote? "Parliament rejected Prime Minister Theresa May's third attempt to gain approval of a proposal for leaving the European Union. Britain now has until April 12 to let the EU know what it will do." "MPs have rejected Theresa May’s EU withdrawal agreement on the day the UK was due to leave the EU. Mrs May now has until 12 April to seek a longer extension to the negotiation process to avoid a no-deal Brexit on that date." + Video: Jeremy Corbyn: "This deal now has to change"
"MPs will debate the petition but government says stopping Brexit would ‘break promises’." "Theresa May has struggled to get her deal through Parliament"
which read 'Brexit is Rubbish', 'Revoke Article 50' and 'We Love EU'." "The Put it to the People anti-Brexit demonstration takes place in central London"
"Prime minister says longer delay would mean a failure to deliver on 2016 referendum"
"Brexit! Brexit! Brexit! It's all anyone is talking about in Britain. Do you understand Brexit? It's ok if you don't because I'm not sure anyone really understands it. So I have made this English lesson for people who want to understand it better. Brexit explained in 13 words. Enjoy!" in which she made no change to her demands despite her Brexit plan being voted down by a 230-vote margin this week." "Theresa May has survived a no-confidence vote in her government and fended off Labour leader Jeremy Corbyn’s attempt to force a general election. "Theresa May's government survived a non-confidence vote in the U.K Parliament just one day after her Brexit plan faced a historic defeat." "The House of Commons, voted 432 to 202 against the plan negotiated by members of May’s government." "With six months to go until the UK's departure from the EU, BBC News asked the Institute for Government to assess the government's progress towards Brexit. The think tank says time is running short to implement the process successfully. Reality Check's Chris Morris takes a look at the main findings. Read more." The Commons defeat - the largest in history, by 432 votes to 202 - came as a huge blow for Mrs May." + How did your MP vote? + Reality Check: Does Brussels blink? + Laura Kuenssberg: Can May find common cause in Parliament? + What is a no confidence motion? + Katya Adler: Will EU help after May's defeat? "Prime Minister Theresa May's Brexit deal has been rejected by 230 votes. It's the biggest ever government defeat in history. The so-called "meaningful vote" comes at the end of five days of debate over the plan. MPs voted by 432 votes to 202 to reject the deal, which sets out the terms of Britain's exit from the EU on 29 March." "MPs will vote on the UK's Brexit deal in the week beginning 14 January, Theresa May has told Parliament"
+ Video: PM on EU: "There is no plot to keep us in backstop." + Video: Could there be a second Brexit vote? + Reality Check: How could new referendum work? + Watt: Could John Bercow end the Brexit gridlock? "Theresa May has said it is still possible to get the assurances MPs need to back her Brexit deal, despite EU leaders ruling out any renegotiation." + Video: A quiet word in your ear...but what did Theresa May say to EU's Juncker? + Why isn't Labour trying to topple May now? "Prime Minister Theresa May has won a vote of confidence in her leadership of the Conservative Party by 200 to 117." + What next for Theresa May? Amber Rudd must oversee the rollout of the universal credit system." "Stephen Barclay has been picked as the new Brexit secretary, as Theresa May seeks to fill her cabinet after several of her top team quit." + Who is Stephen Barclay? + How could May turmoil affect Brexit? "Boris Johnson warns the Conservatives will be 'punished' for Chequers at the polls as he urges Theresa May to 'chuck' her plan"
how did this side win? For the answer, they go to Labour conference, and then to a massive distribution centre at the cutting-edge of the new economy"
"Dublin and Frankfurt are most likely to benefit from UK’s departure from EU, says accountancy firm." "The number of EU citizens emigrating from Britain has increased by a third to 122,000 over the past year in the wake of the EU referendum, new figures have found." "Who's who in Theresa May new Cabinet following the snap election in June 2017." "Britain’s Theresa May will stay on as prime minister despite her Conservative Party’s loss of majority in parliament. May will attempt to form a government with Northern Ireland’s Democratic Unionist Party after her party suffered major losses in a parliamentary election." "The general election has ended in a hung Parliament, where no party has the 326 seats needed to get an overall majority in the House of Commons. "The result of the UK election has sent shockwaves across Europe and beyond." What happens when no-one wins the election? "Last week, Britain started the process of officially withdrawing from the European Union. British is already involved in a heated disagreement with EU and Spanish officials over the future of Gibraltar." "Britain presented European Council President Donald Tusk with a letter invoking Article 50 of the Treaty of Lisbon. The letter begins the two-year process of withdrawing from the EU. Many expect the process to be complex and take longer than expected." "Watch in full Theresa May's Brexit statement following the triggering of Article 50." "Memes have been taking over the internet as the UK begins the process of leaving the European Union." "Theresa May’s imminent triggering of article 50 produced the inevitable crop of bad puns – but little in the way of regret." "Theresa May has officially triggered Article 50 with a letter informing the European Council of Britain's intention to leave the European Union. Read here in full, the six-page letter which launches two years of Brexit negotiations." After one of the most bitter political campaigns in recent years, over 52% of the nation voted to leave, despite large areas such as London and Scotland voting overwhelmingly to remain." Withdrawal of the United Kingdom from the European Union, "often shortened to Brexit (a portmanteau combining the words "Britain" and "exit"), is a political aim of some advocacy groups, individuals and political parties in the United Kingdom (UK). The central group of advocates for Brexit is VoteLeave, which is composed of a broad range of groups ranging from Labour to Conservative. In 1975 a referendum was held on the country's membership of the European Economic Community (EEC), a precursor to the European Union (EU). The outcome of the vote was that the country continued to be a member of the EEC. A referendum on the country's membership of the EU will be held on 23 June 2016 following the passing of the European Union Referendum Act 2015." "On June 23 the British public will decide whether or not to remain a member of the European Union. The result will have lasting ramifications not just for the UK, but the rest of Europe and the world too..."
Many have lived here for decades and count Britain as their home, but they can't vote in the referendum on whether to remain in the European Union. So what do they make of the vote?" take to the streets to try to win over voters." "The UK has regretted "turning its back" on Europe in the past, the PM said, arguing the European Union has "helped reconcile" countries and maintain peace." "The sculptor Anthony Gormley, children’s illustrator Axel Scheffler and photographer Rankin are among 14 internationally-renowned artists to unveil posters in support of keeping Britain in the EU..."
"The UK Prime Minister Theresa May is battling to save the Brexit divorce deal with the European Union, and her job." sparking a row over free speech in Brussels." an anthology is set to shine a new light on Jeremy Corbyn." we take a look at the world’s most powerful political street art." as at home – and as many laughs. 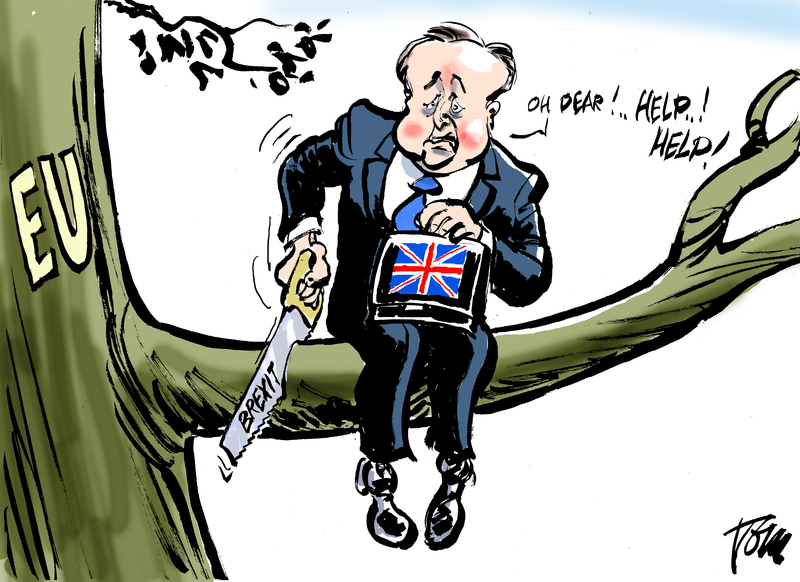 Observer cartoonist and children’s laureate Chris Riddell offers a roundup of humour from across the continent." + WHY IS THE BULLDOG A SYMBOL OF BRITAIN? "British lawmakers voted to reject Prime Minister Theresa May's latest Brexit deal by a margin of 58 votes. The rejection has left many questions unanswered -- including when, or even if, Britain will leave the EU -- and plunges the three-year Brexit crisis into deeper uncertainty." "In 2016, the UK decided to leave the EU, but British politicians are having a hard time coming up with a plan, despite the target date of March 29, 2019. Americans are already confused about the kingdom that is four countries, and the European Union that has many countries and acts like one -sometimes. CGP Grey has an update and discloses that the problem is Northern Ireland. A second video goes further into the Brexit negotiations, and it shows us how the EU is more complicated than you realized." "As fears of a no-deal Brexit increase, John Harris and John Domokos go to where everything gets real: the line that separates Northern Ireland and the Republic. In parts of the province where support for Remain and anxiety about what might now happen run deep, they find ghosts from the Troubles, passionate opinions, and a new crop of politicised young musicians, desperate to escape the pull of the past"
"An update of an earlier sketch we did before Brexit, the situation has become a little more unclear since"
"À la veille du vote du Parlement sur l'accord du #Brexit, la campagne pour un second référendum n'est pas terminée." "It’s election day … again. Just two years after the last general election and a year after Brexit, British voters are being bombarded with ballots. So can Theresa May increase her parliamentary majority? Or will Jeremy Corbyn mobilise an army of anti-austerity voters to carry him into Downing Street? With turnout crucial to the result, who will prevail?" citizens’ rights and much more." The full series can be found on LSE's You Tube channel."